The 18th century saw the beginnings of two changes that would greatly affect Wales, the Welsh Methodist revival, which led the country to turn increasingly nonconformist in religion, and the Industrial Revolution greatly affected Wales. During the rise of the British Empire, 19th century Southeast Wales in particular experienced rapid industrialisation and a dramatic rise in population as a result of the explosion of the coal and iron industries. Wales played a full and willing role in World War One. The industries of Empire in Wales declined in the 20th century with the end of the British Empire following the Second World War, while nationalist sentiment and interest in self-determination rose. The Labour Party replaced the Liberal Party as the dominant political force in the 1940s. Wales played a considerable role during World War Two along with the rest of the United Kingdom of Great Britain and Northern Ireland and the Allies, and its cities were bombed extensively during the Nazi Blitz. The nationalist party Plaid Cymru gained short lived momentum in the 1960s. In a 1997 referendum Welsh voters approved the devolution of governmental responsibility to a National Assembly for Wales, which first met in 1999. Following the last ice age, Wales became roughly the shape it is today by about 8000 BC and was inhabited by Mesolithichunter-gatherers. The earliest farming communities are now believed to date from about 4000 BC, marking the beginning of the Neolithic period. This period saw the construction of many chambered tombs particularly dolmens or cromlechs. The most notable examples of megalithic tombs include Bryn Celli Ddu and Barclodiad y Gawres on Anglesey,Pentre Ifan in Pembrokeshire, and Tinkinswood Burial Chamber in the Vale of Glamorgan. Metal tools first appeared in Wales about 2500 BC, initially copper followed by bronze. The climate during the Early Bronze Age (c. 2500–1400 BC) is thought to have been warmer than at present, as there are many remains from this period in what are now bleak uplands. The Late Bronze Age (c. 1400–750 BC) saw the development of more advanced bronze implements. Much of the copper for the production of bronze probably came from the copper mine on the Great Orme, where prehistoric mining on a very large scale dates largely from the middle Bronze Age.Radiocarbon dating has shown the earliest hillforts in what would become Wales, to have been constructed during this period. Historian John Davies, theorises that a worsening climate after around 1250 BC (lower temperatures and heavier rainfall) required more productive land to be defended. Wales was a rich source of mineral wealth and the Romans used their engineeringtechnology to extract large amounts of gold, copper, and lead, as well as modest amounts of some other metals such as zinc and silver. When the mines were no longer practical or profitable, they were abandoned. Roman economic development was concentrated in southeastern Britain, with no significant industries located in Wales. This was largely a matter of circumstance, as Wales had none of the needed materials in suitable combination, and the forested, mountainous countryside was not amenable to development. The killing of Bleddyn ap Cynfyn in 1075 led to civil war and gave the Normans an opportunity to seize lands in North Wales. In 1081 Gruffudd ap Cynan, who had just won the throne of Gwynedd from Trahaearn ap Caradog at the Battle of Mynydd Carn was enticed to a meeting with the Earl of Chester and Earl of Shrewsbury and promptly seized and imprisoned, leading to the seizure of much of Gwynedd by the Normans. In the south William the Conqueror advanced into Dyfed founding castles and mints at St David's and Cardiff.Rhys ap Tewdwr of Deheubarth was killed in 1093 in Brycheiniog, and his kingdom was seized and divided between various Norman lordships. The Norman conquest of Wales appeared virtually complete. Out of the power struggle in Gwynedd eventually arose one of the greatest of Welsh leaders, Llywelyn ab Iorwerth, also known as Llywelyn Fawr (the Great), who was sole ruler of Gwynedd by 1200 and by his death in 1240 was effectively ruler of much of Wales. Llywelyn made his 'capital' and headquarters at Abergwyngregyn on the north coast, overlooking the Menai Strait. 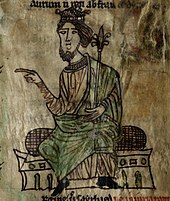 His son Dafydd ap Llywelyn followed him as ruler of Gwynedd, but king Henry III of England would not allow him to inherit his father's position elsewhere in Wales. War broke out in 1241 and then again in 1245, and the issue was still in the balance when Dafydd died suddenly at Abergwyngregyn, without leaving an heir in early 1246. Llywelyn the Great's other son, Gruffudd had been killed trying to escape from the Tower of London in 1244. Gruffudd had left four sons, and a period of internal conflict between three of these ended in the rise to power of Llywelyn ap Gruffudd (also known as Llywelyn Ein Llyw Olaf; Llywelyn, Our Last Leader). The Treaty of Montgomery in 1267 confirmed Llywelyn in control, directly or indirectly, over a large part of Wales. However, Llywelyn's claims in Wales conflicted with Edward I of England, and war followed in 1277. Llywelyn was obliged to seek terms, and the Treaty of Aberconwy greatly restricted his authority. War broke out again when Llywelyn's brother Dafydd ap Gruffudd attacked Hawarden Castle on Palm Sunday 1282. On 11 December 1282, Llywelyn was lured into a meeting in Builth Wellscastle with unknown Marchers, where he was killed and his army subsequently destroyed. His brother Dafydd ap Gruffudd continued an increasingly forlorn resistance. He was captured in June 1283 and was hanged, drawn and quartered at Shrewsbury. In effect Wales became England's first colony until it was finally annexed through the Laws in Wales Acts 1535-1542.